Make the pastry: cream together the butter and sugar. Add the eggs, wine and vanilla. Mix well. Fold in the flour and salt then bring together with your hands into a dough. Wrap and chill. Preheat the oven to 200°C, gas mark 6. Butter a deep 25cm, springform tin. Mix the raisins, nuts, peel, spices and breadcrumbs. Heat the honey in a bowl over a pan of boiling water, then stir into the nut mixture. Set aside. Divide the pastry in 2 pieces (2/3 and 1/3). Roll out the larger piece in to a disc to line the base and sides of the tin with 2cm extra at the edge. Put in the tin. Add the filling mixture. Bring the edges of the dough over the filling. Roll out the small piece and trim to fit the top of the tin. Brush the dough with water. Put the top on the filling. Press the edges firmly. Brush with beaten egg and pierce with a skewer. Bake for 30 minutes. Reduce the heat to 180°C, gas mark 4 and bake for 15 minutes. 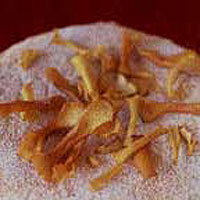 Cool in the tin (and decorate with the baked peel of unwaxed oranges and lemons if desired), then serve in slices.